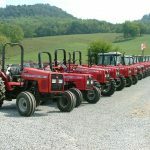 It is important to maintain farm equipment to make sure the equipment works properly for many years but also does not rust or deteriorate. Painting with the proper sprayer is critical to a good finish and long lasting paint on the equipment. Whether for exhibition, restoration, resale or maintenance of existing equipment Apollo Sprayers will provide a perfect finish from primer to finish coat while reducing paint overspray and consumption 40% – 50%. Use one of the Apollo Sprayers HVLP Turbospray mobile systems to take the equipment to the job or use one of Apollo Sprayers award winning HVLP spray guns for compressed air to achieve that perfect finish.